This is the very first time I’ve ever attempted to decorate a cookie with royal icing and the whole “flooding” technique. I don’t have any step-by-step picturess for you yet… I was too busy trying to NOT get icing everywhere (#fail). I think they turned out okay but I obviously had my icing too runny, or I just used too much icing… either way, I had, um…. overflow (see below… under the cooling rack and dripping off several of the cookies). But I learned a few things and will improve next time… that’s what matters, right? So, I don’t have pics, but I’ll give you a few details of how I did this. According to my children, this is not the best tasting cookie they’ve ever had, so I won’t be sharing the recipe (I didn’t get to try them, I’m doing a 40 day sugar fast). 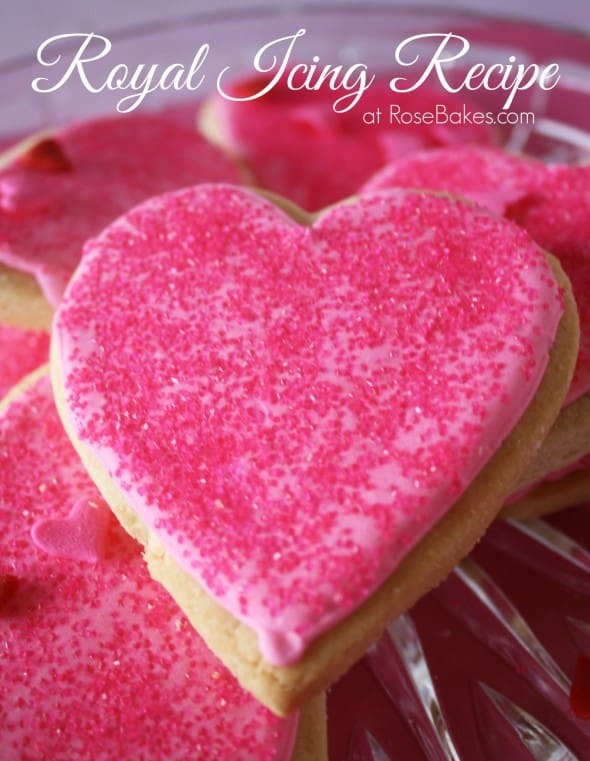 Update: I now have a favorite roll-out sugar cookie recipe! But if you find yourself a really good roll-out sugar cookie recipe… or these Brownie Roll Out cookies would work perfectly too, then I’ll you can follow these (very vague) instructions to try these yourself! 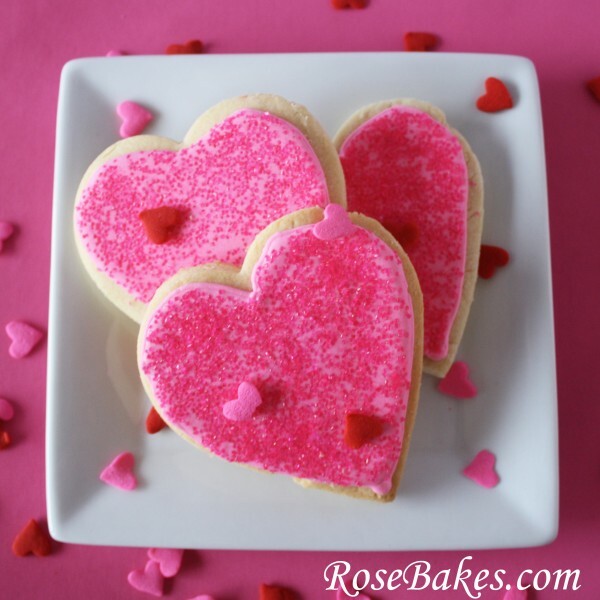 I used the largest cutter in this Ateco Heart Cookie Cutter set for these cookies (about 3″ tall, I guess). 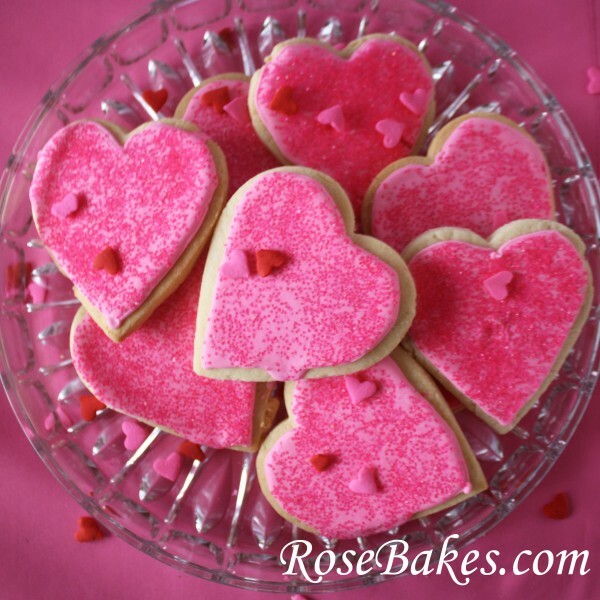 Then after they’re baked and cooled, you’re going to use royal icing to get the effect. 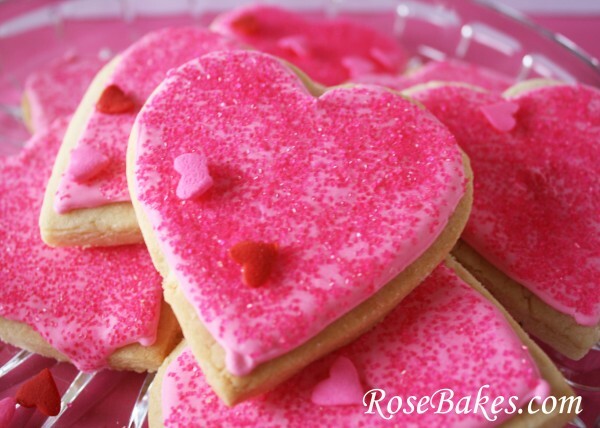 After drawing an outline with some really thick royal icing (see recipe below), allowing it to set, and then thinning it out and “flooding” the center, I sprinkled on some hot pink sugar and that prettied them right up! My kids did really liked the royal icing, so I will share with you how I made it! I found this recipe over at Bake at 350 and it’s definitely a keeper! At Bridget’s recommendation, I used Americolor Premium Meringue Powder and the recipe below. 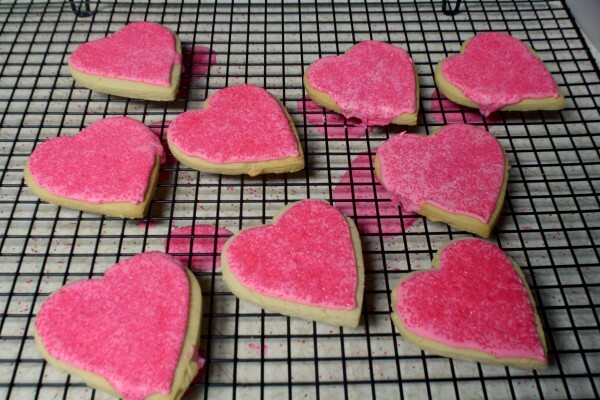 After flooding the cookies, while they were still wet, I used Pink Sugar and Jumbo Heart Sprinkles to decorate! Then I just let them dry overnight and they were good to go! Is this like those wonderful cookies at Janie’s Bakery? I’ve never had Janie’s cookies, so I don’t know! Were can I find Merengue Powder? I buy it online at Amazon here or Country Kitchen Sweetart, but you can also get it at grocery stores, Walmart, or any baking supply store. sigh. is it already time to contemplate valentine’s day? as festive treats go, i like these–tasty, pretty, and not too complicated! I feel your pain! 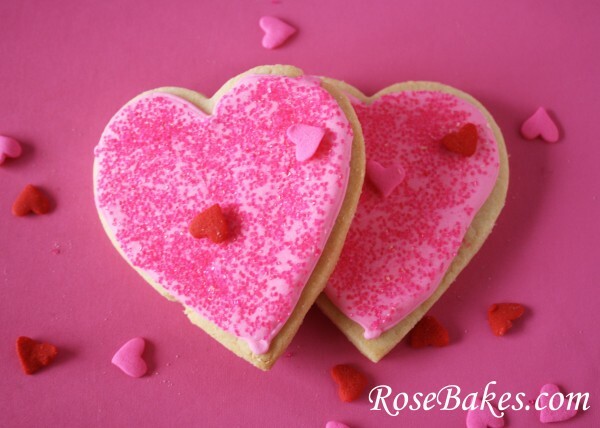 I’m a bad blogger though… I haven’t made or done anything *new* to blog about for Valentines and I see other bloggers already rolling out brilliant new ideas. I was just trying to get in the mood by recycling this old post… ha! Hi Rose!! What does “scant” mean? Hot water? I am going to do some figures with this recipe. Love your work!! Slightly less than full or slightly less than whole… just a bit shy of filling up your 1/4 cup measuring cup. What did you use and how did you do the details on top of the icing? I buy it at Walmart or I know you can get it at cake or bakery supply stores. For your frosting recipe…is the frosting soft in the middle while drying hard on the top? It’s not super hard – it’s light/crunchy when it dries.